The decisions we make on a day to day basis can have serious impacts, good and bad, on our marital life. Financial disagreements can harm your relationship and ruin the beautiful bond that you share as a married couple. According to a recent study, the leading cause of divorce has been identified as financial disagreements. While it is impossible to expect two parties to agree with each other all the time, it is crucial for married couples to realize that harmony and peace can be maintained, even during disagreements. Marital harmony can only be achieved when the two people make stable decisions and work together to improve their current circumstances. If money has been the leading cause of arguments between you and your loved one, it is time to fix this issue once and for all. Start by creating an appropriate budget, as it will help you avoid countless money related issues in the long run. You need to think and plan strategically, as money issues can soon turn into emotional issues that have the potential to ruin your marriage for good. The first step towards achieving martial harmony is to define clear goals that both partners can communicate with each other. Sharing the same goals for the future will allow you to set your priorities straight and begin saving to achieve those targets that you have in mind. The real path to fulfillment lies in sharing a similar vision for a prosperous future. Therefore, you need to align your views, beliefs, and values to work towards a common purpose. Without a proper vision in place, how do you even expect to follow a common path? Not having a proper vision in place leads you to a state where you want ‘more’ of everything, which keeps you from feeling content. You cannot expect to build a harmonious relationship together if you do not feel at peace. Following a common goal or purpose will give you the clarity that you need to make appropriate financial decisions. Budgeting will allow you to identify the areas where you are spending excessively, enabling you to limit those unnecessary expenses. It enables you to form the right habits that will benefit you in the long run. 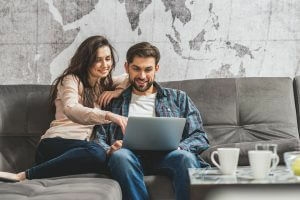 Once you have formed a unified vision and share common goals, it will be easier for you to work in coherence with your partner and cultivate better spending habits to accommodate that vision. Moreover, you will be able to hold yourself accountable for your spending and will make conscious purchasing decisions. No matter how practical your strategy is, it will remain ineffective if you do not learn to live within your means. Your primary goal should be to plan your financial management strategy according to your means. Going overboard or reckless spending is only going to harm you in the long run. Therefore, you need to allocate your finances in a better manner and adopt a balanced approach if you want to achieve marital harmony. Both parties need to stick to the budget and refrain from over-spending or spending on useless things. If either person is spending recklessly, you need to sit down and discuss the issue to find an appropriate solution. It might not be an easy topic to tackle, but it will benefit your relationship in the long run.